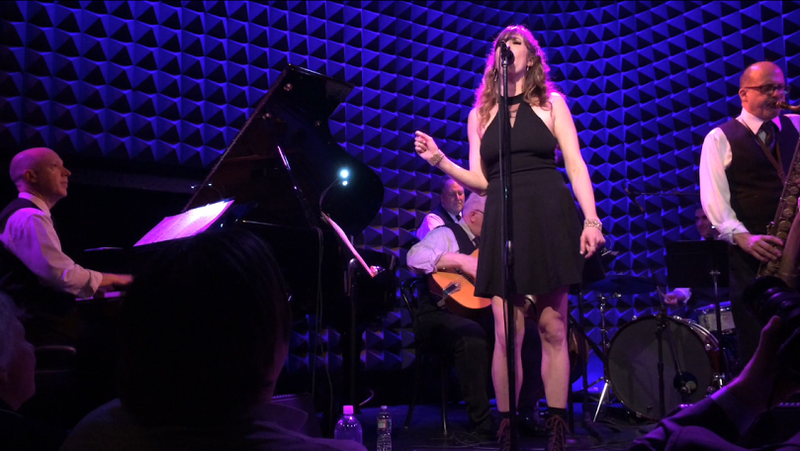 Late last Friday night, I and an illustrious audience (including Terry Waldo, Mike Davis, and Mike Zirpolo) enjoyed a stirring evening of music at Joe’s Pub. 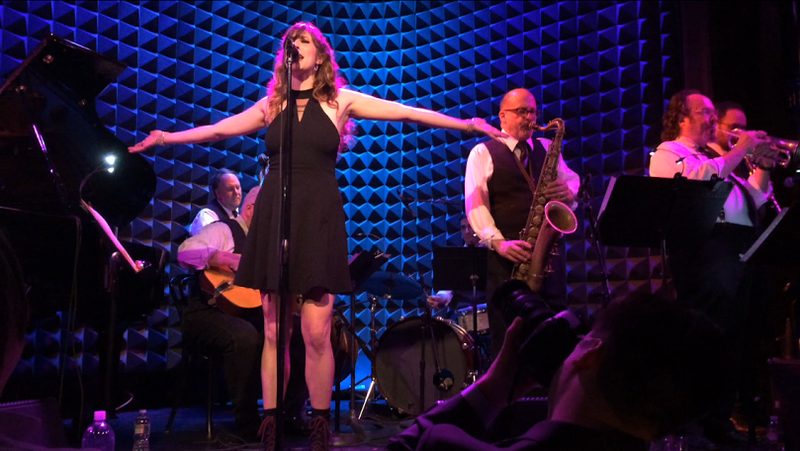 Miss Ida Blue and a stunning band of New York jazzmen paid tribute to Billie Holiday in her centennial year. 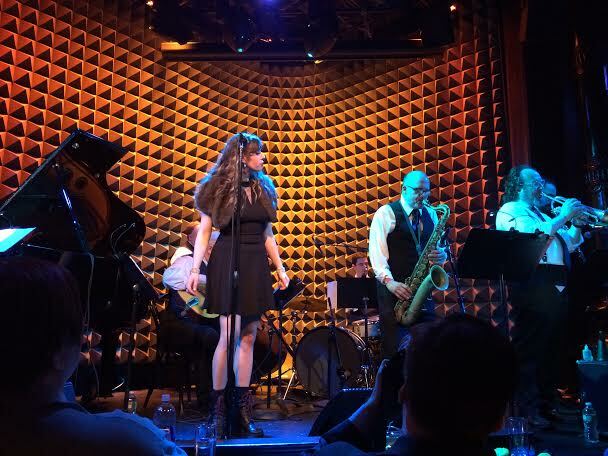 Miss Ida has impressed me in her appearances with the Yerba Buena Stompers, as a delightfully personal interpreter of Twenties blues, but at Joe’s Pub she absolutely surpassed herself. It wasn’t because she suddenly succeeded at imitating Billie or “channeling” her — but because the spirit of Thirties Billie animated her, making her even more joyously herself. The sixteen songs she and the band delivered came from 1933 (YOUR MOTHER’S SON-IN-LAW) to 1944 (I COVER THE WATERFRONT). Without offering a history lesson, she and the band happily evoked a singer, an era, and a world of heedless yet expert music. A word about the superb band. Like Miss Ida, they evoked rather than copied. Pianist Conal Fowkes had created arrangements that kept the contours of the original recordings without tying the musicians to the manuscript paper. And he swung out in his own delicate yet ardent version of Teddy Wilson’s glowing style. Conal’s rhythm section mates are wonderful swingers as well, and they meshed gloriously: John Gill, guitar; Brian Nalepka, string bass; Kevin Dorn, drums. Their pleasure was evident even when I couldn’t see their faces. Their rhythmic rocking was a treat; they never faltered. And the tempos were in themselves delightful and instructive: always slightly faster or slower than the original inspirations, which gave me a sense of looking at a newly cleaned masterpiece, or someone lovely who always wears black, turning up in mint green. The most pleasing small shocks. The horn soloists were uniformly eloquent: reed heroes Jay Rattman and Dan Block occasionally made me recall Buster Bailey and Lester Young, but they sounded so much like themselves that it was deeply authentic music; Block, especially, took on a heavier tone and more definite attack than the floating Lester of that period, although his obbligatos behind Ida were touching clouds of sound. Jon-Erik Kellso loves Buck Clayton, so occasionally he offered a ringing statement in the best Basie manner, but we wouldn’t know Jon without his plunger mute, so often there was a good deal of Cootie’s ferocity audible there. As always, his melody statements and ride-outs were lyrical, memorable. The band sounded well-rehearsed but happily loose. Miss Ida, most appealingly, knows where she has come from, and has a sweet earnest reverence for her ancestors. Not just Billie, but Miss Ida Cox [hence her chosen stage name] and it was very pleasing to hear her and the band do their soundcheck for us with a tough blues in honor of B.B. King, the monarch who just made the transition. 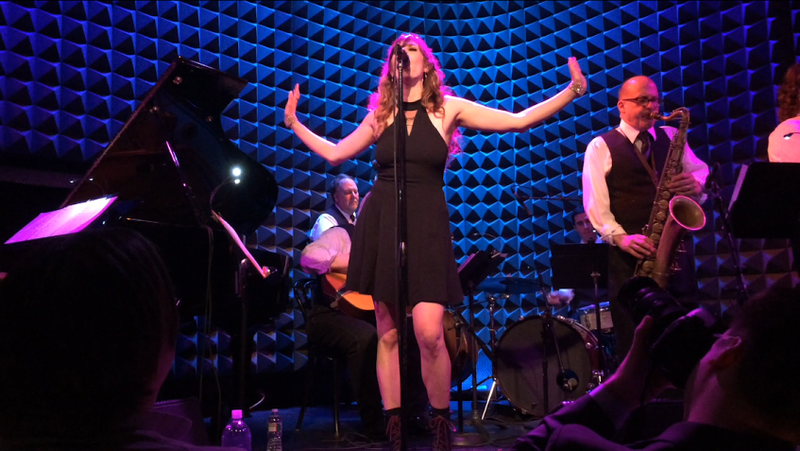 And she was so happy to be at Joe’s Pub, honored to sing for Billie and for us. 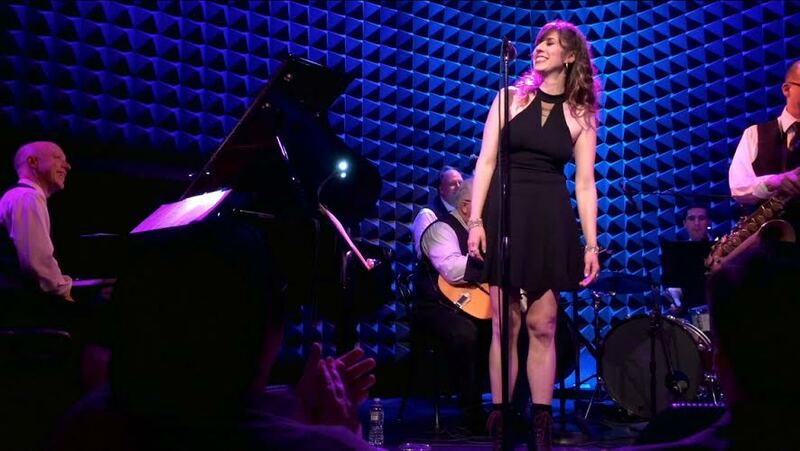 Early in the evening, she turned and waved happily at the rhythm section as if she just couldn’t believe her good fortune to be on the stand with her heroes. Ours, too. She told us how her hair had caught on fire at a gig (Kevin Dorn, the 007 of swingtime, rescued her); I wonder if she knows the story of Billie, the curling iron, and the gardenia — told to us by Sylvia Syms, whose recollection I trust completely. A sign from the heavens of some destiny. Listening closely to Miss Ida (as well as the gorgeous band) I began to hear aspects of her style I’d not heard before. For one thing — and I mean this as praise — she is a substantial stage personality. One way this is expressed is in her nearly constant yet genuine motion, as if her energy is too strong for her to stand still. It’s not just hair-tossing, but a continual series of dance moves that also look like yoga poses and warm-up stretches, even a jubilant marching-in-place. Often she held her arms over her head, her hands open. I think it was always exuberant emotion, but it was also her own expression of an ancient and honorable theatrical style . . . so that even the people in the most distant balcony of the Apollo Theatre could see you and join in with the person onstage. And her voice matched her larger-than-life physical presence. On a Twenties record label, she might have been billed as COMEDIENNE WITH ORCHESTRA, and that odd designation rang true. The comedy bubbled up here and there in speech: she hails from Brooklyn, so that her sailboat in the moonlight was idling along in Sheepshead Bay. But it also emerged delightfully in her voice: I heard echoes of Fanny Brice, of comic Eastern European melodies . . . it never sounded as if she was taking Billie or the music lightly, but as if she was having such a good time that she couldn’t help playing. And the audience loved it. It was SHOW in the best tradition — not caricature, but something Louis would have admired immensely. Without a hint of self-conscious “acting,” Miss Ida let those melancholy narratives of heartbreak unfold eloquently for us. Although I had known her almost exclusively as a blues singer, I saw her, in a blinding flash, as a deep ballad singer, someone who could break our hearts while singing of her own distress. I could write more about the beauties of this evening, of I’M GOING TO LOCK MY HEART, of MY FIRST IMPRESSION OF YOU, and the other performances by Miss Ida and her band that impressed me so, but I will instead simply hope that she gets many more opportunities to create this wonderful evening in other places, for other audiences. Early on in this performance, she turned to us, and grinning, said, “This is so so so exciting!” It was and it is. This entry was posted in "Thanks A Million", Bliss!, Generosities, Hotter Than That, Ideal Places, It's All True, Jazz Titans, Jazz Worth Reading, Pay Attention!, Swing You Cats!, That Was Fun!, The Heroes Among Us, The Real Thing, The Things We Love, Wow! and tagged B.B. King, Billie Holiday, blues, Brian Nalepka, Buster Bailey, Conal Fowkes, Dan Block, Fanny Brice, Jay Rattman, Jazz Lives, Joe's Pub, John Gill, Jon-Erik Kellso, Kevin Dorn, Lester Young, Louis Armstrong, Michael Steinman, Mike Davis, Mike Zirpolo, Miss Ida Blue, swing, Terry Waldo. Bookmark the permalink. Thank you, Michael. Although I sadly wasn’t there, your account made me feel that I was. This is a unique gift that you have, and we are all the beneficiaries. ould you use your video/audio recorder on site? I would really like to listen to this performance. I would have liked to do just that, but the performance space did not allow it. Alas. Next time, I hope! I am sure that someone held up an iPhone at some point, so you may not be totally deprived. She is an exceptional talent.